Home > Shop By Fragrance > Fragrance List > Eucalyptus > Eucalyptus - Reed Diffuser Oil - Refill - 8 oz. Eucalyptus - Reed Diffuser Oil - Refill - 8 oz. Trinity Candle Factory Premium Scented Eucalyptus - Reed Diffuser Oil - Refill. This elegant style Reed Diffuser Refill comes in all fragrances, premium scented for maximum fragrance throw. This candle smells like fresh cut eucalyptus. An medicinal herbaceous aromatherapy candle. One of our very best sellers and great for the holidays. 100% Satisfaction Guarantee. This is a great diffuser and the scent really lasts. Shipping was very quick also. This has a pleasing, light fragrance, but it is NOT really strong enough for a reed diffuser. If I'm next to the diffuser, I can smell it but it doesn't really freshen the room smell. I probably won't purchase again because it doesn't do what I wanted it for. 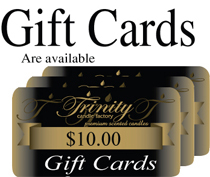 Trinity Candle Factory Response: Thank you for your feedback. To help the scent travel up the reeds, we suggest flipping the reed sticks over after the first day of use. For more scent throw, you can flip your sticks as needed. Hope this helps. Hard to find locally, diffuser oil. A favorite of mine. Lightning fast mail delivery. Very good value. Very fragrant. I have been a Yabkee Candle user in the past and will be using Trinity going forward. The oil has a very strong smell which I like because you can smell it throughout the whole room. Reed Diffusers > Reed Diffuser Refill - 8 oz.